Joseph A. "Joe" Harsa, Sr. Celebrating the life of Joseph A. "Joe" Harsa, Sr.
Obituary for Joseph A. "Joe" Harsa, Sr.
Joseph A. "Joe" Harsa, Sr., age 81, of Plainfield, IL since 2000, a resident of Naperville, IL 1970-2000, passed away unexpectedly on Friday, February 8, 2019 at Edward Hospital in Naperville. He was born on June 13, 1937 in Cleveland, OH. Beloved husband of Sue L. Harsa (née Mooney) and the late Connie J. Harsa (née Winkler), loving father of Jean Chocola of Aurora, IL, Michelle (Greg) Chapman of San Diego, CA and Joseph A. (Dallas) Harsa, Jr. of Raleigh, NC, loving step-father of Todd (April) Koenitz of Holly Springs, NC and Carey (Nancy) Koenitz of Chicago, IL, adored grandpa & papa of Joe (Maria) Chocola and Adam (Merri) Chocola; Kylie and Cassady Chapman; Regan and Cole Harsa; Logan and Carter Koenitz, cherished great-grandpa of Mason Chocola, devoted son of the late Clarence and Mary Harsa, dear brother of Georgia (the late Dan) Ferguson, Rita (Ed) Logue and the late James (Chris) Harsa, brother-in-law of Butch (Patti) Winkler, Richard (Robin) Cordes, Diane (the late Rick) King, the late James (Mary Therese) Winkler and the late Nancy Cordes, fond uncle, great-uncle and friend of many. Joe grew up in Cleveland, OH and attended St. Edward High School, Class of 1955. He served in the U.S. Army from 1957-1959 and graduated from John Carroll University, University Heights, OH in 1963 with a degree in Business Administration. 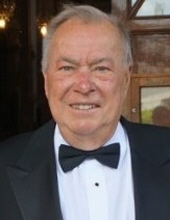 Joe worked over thirty years with Sears, Roebuck and Company, retiring as a senior buyer in 1993 after 30 years of service. Joe was a current member of St. Mary Immaculate Catholic Church in Plainfield and a former member of SS. Peter & Paul Catholic Church and St. Margaret Mary Catholic Church, both in Naperville. He enjoyed playing tennis at The Naperville Racquet Club, traveling and writing a column called "Cup of Joe" for the "The Lakes of Plainfield Life", a social magazine for the Lakelands, Lakelands Club, The Lake By The Creek & Estate Homes on waterfront in Plainfield. Joe especially loved spending time with and watching the sporting events of his children and grandchildren. Visitation Thursday, February 14, 2019, 4:00-8:00 PM at Friedrich-Jones Funeral Home & Cremation Services, 44 S. Mill St, Naperville, IL. If you can, come share your love for Joe on Valentine's day. Services will begin Friday, February 15, 9:15 AM from the funeral home and will proceed to a 10:00 AM Mass of Christian Burial at St. Margaret Mary Catholic Church, 1450 Green Trails Dr., Naperville. Future inurnment: SS. Peter & Paul Cemetery, Naperville, IL. For more information, please call (630) 355-0213. To send flowers or a remembrance gift to the family of Joseph A. "Joe" Harsa, Sr., please visit our Tribute Store. "Email Address" would like to share the life celebration of Joseph A. "Joe" Harsa, Sr.. Click on the "link" to go to share a favorite memory or leave a condolence message for the family.